This weeks project comes from necessity, and the fact that today's original project turned into a two-parter that I ended up pushing back for next week and the following. It's going to be a great one though! You should come back and check it out! Hint: Its stripey and has pockets. 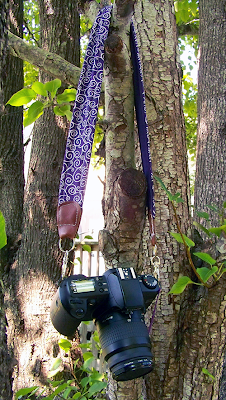 In preparation for my next A.A.T I decided I needed a camera strap so that I can go crazy climbing trees and enjoying nature without having to hold/worry about my camera constantly. 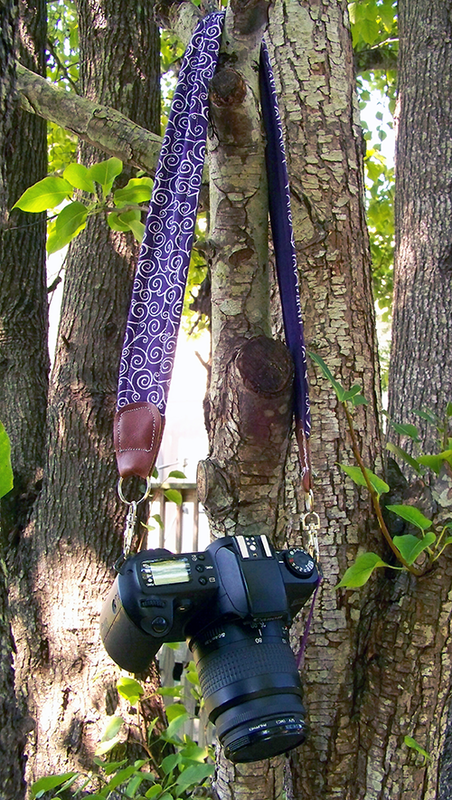 When I took my photography class, my regular length camera strap bugged me so much. It's main problem in my opinion was the length and the fact that it cut uncomfortably into my neck, so I kept that in mind when making my new strap. Step 1: Using your yardstick draw a 2 1/2 in. by 27 1/2 in. rectangle. This is your pattern. 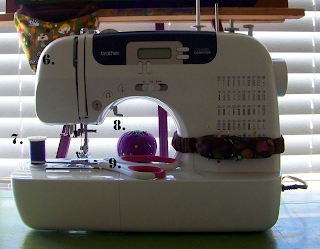 Pin the pattern to your quilting cotton and cut it out. Repeat with the micro suede and the sew-in batting. Step 2: Make a batting-quilting cotton-micro suede sandwich like so, pin, and sew 1/4th an inch seam on both sides. 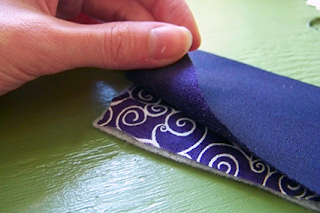 Step 3: Trim down your seam. Turn inside out. 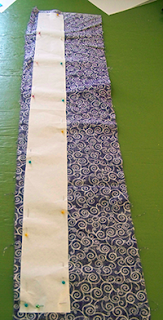 Flatten out the tube so the top fabric and the bottom are even. Pin. 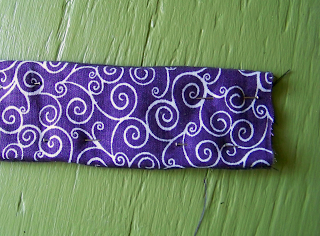 Top Stitch 1/4th inch from the edge. 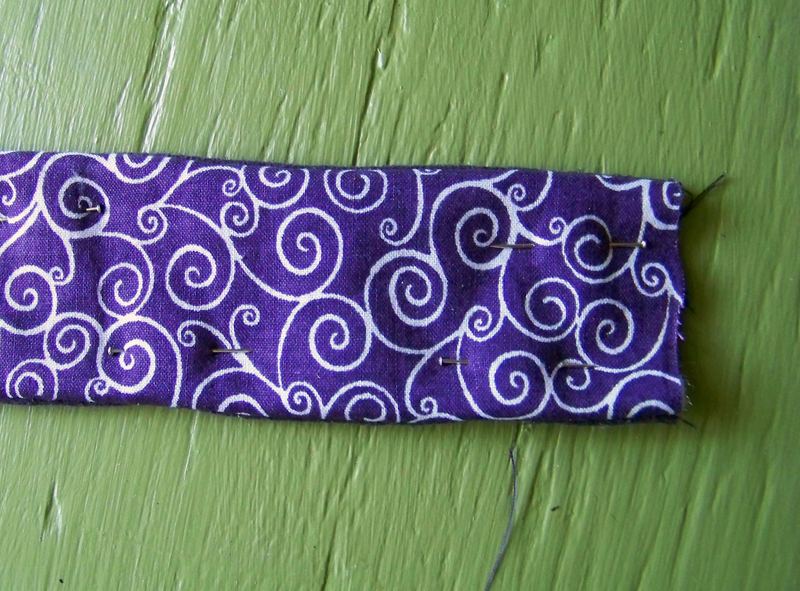 I chose to go with white thread cause I like a nice contrasting top stitch. 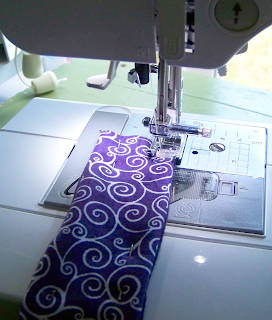 Once that's done, set the strap aside. 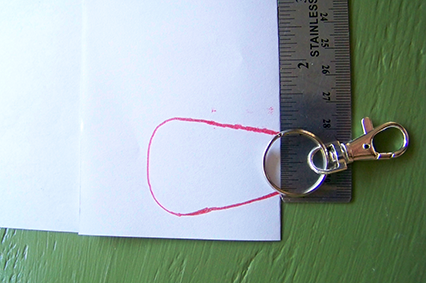 Step 4: Grab some paper, a pencil, and your ruler. Fold the sheet of paper in half and place the ring of your swivel hook onto the edge and mark the meeting points. Now draw a shape that's widest point is 2 in. 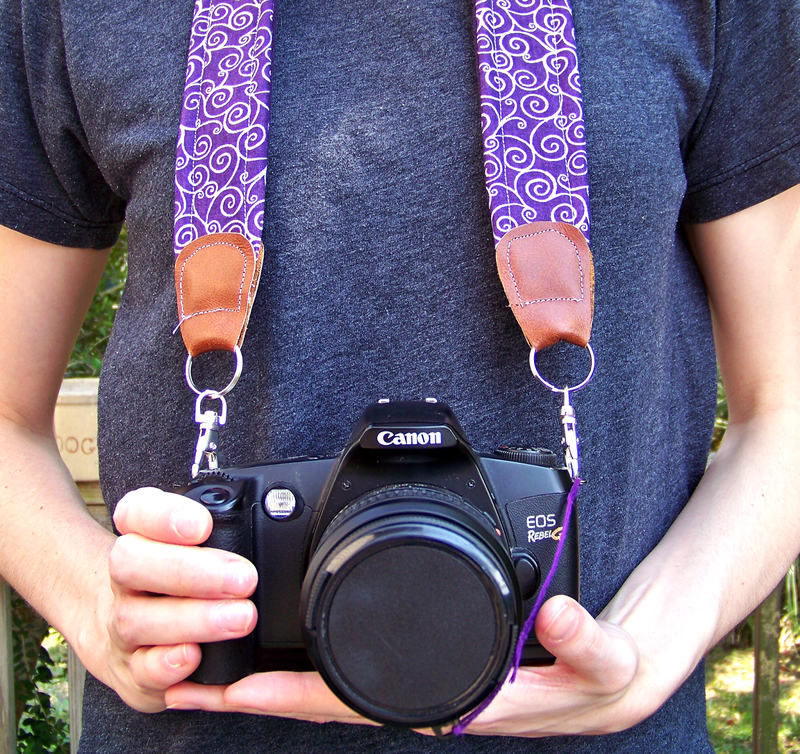 just like the strap. Cut out your tab pattern. I went with the bow tie shape. 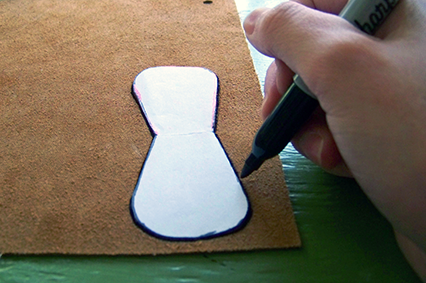 Step 6: Place your tab pattern onto the wrong side of your leather and trace around it. Cut it out. Repeat. I used a sharpie, but cut inside of the line to make sure the size stayed uniform. 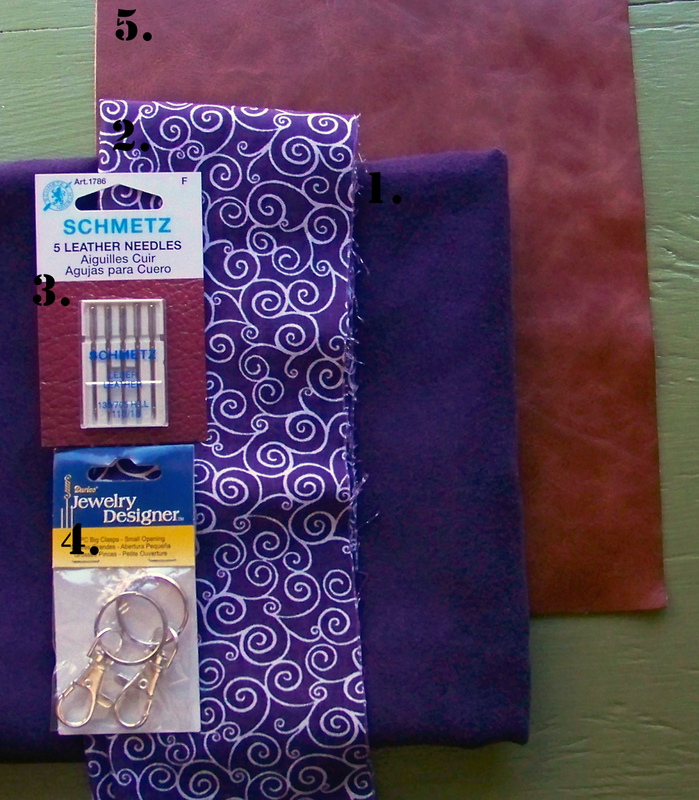 Step 7: Fold the leather tab in half longways and slide the ring (that your swivel hook is attached to) onto the tab. Now let the ring rest in the smallest part of the tab, as pictured below. 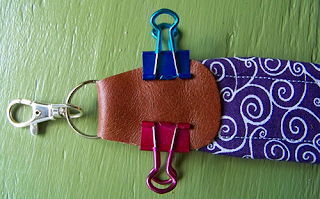 Once the leather and hook part is ready, attach it to the end of the strap (it encompasses about an inch of strap) and use the binder clips to hold it in place. Now switch out your regular needle for a leather one and sew about 1/8th inch around the edge of the leather tabs. 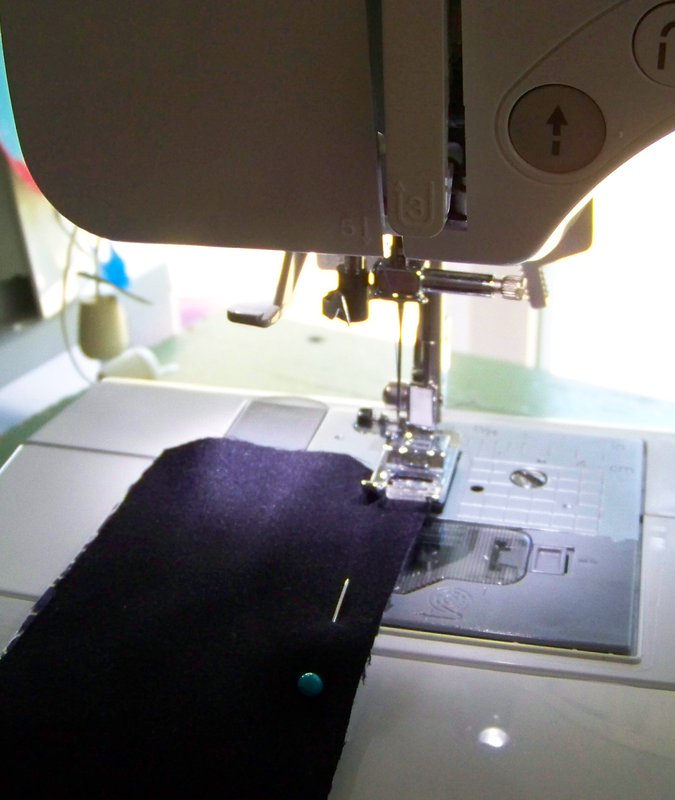 I would advise going super slowly, because if you mess up and have to pick out your stitches, you're going to have puncture holes. I mostly just turned the hand wheel and adjusted the tab under the presser foot as I went along. Voila! You have an adorable, soft, and cushioned camera strap! This is my SLR I used in Photography 1, luckily my real camera isn't so big or bulky. I don't know if you guys can tell yet, but my favorite color is purple..and green, I'm like Marie from Breaking Bad on steroids. 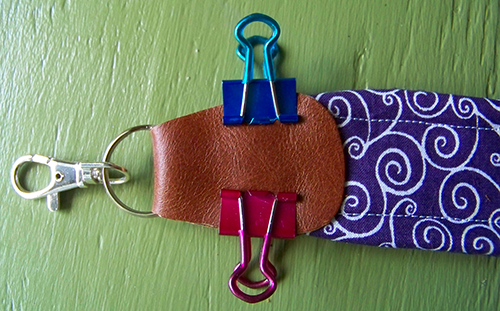 I love adorable functional projects don't you? I also love how light but super soft this strap is! Not to mention it's the perfect length for me, it fits right where I want it and keeps the camera close to my body, which will be perfect for exploring! As always if you guys make one from this tutorial I'd love to see it! Thanks! I loved it, very whimsical. Also thanks for being my first ever commenter!